It’s been a year since we were forced to watch Arie and Lauren hang out together in silence on The Bachelor, and I’ve mostly stopped being annoyed by them. For all of Arie’s bullsh*t about breaking up with Becca on national television, it genuinely seems like he made the right choice. Arie and Lauren are now married with a baby on the way, and it feels like they are happy together and committed to one another. But just because we don’t have to suffer through watching their dates anymore doesn’t mean that everything is perfect. In fact, it looks like they’re now forcing Planet Earth to suffer through their dates instead. A couple days ago, Lauren posted this photo of her and Arie at Antelope Canyon, which is in Arizona. The canyon is famous for its smooth, wavy walls and narrow pathways, and it’s really beautiful. Lauren’s caption about not carrying herself/Arie not carrying her/idk is very confusing to me, but whatever, it’s a cute pic. Okay the caption is really still driving me crazy (like, is she implying that by carrying her, Arie is also carrying the baby? Because if that’s the case, I have an anatomy class I need her to sign up for), but other than that I wasn’t mad about the picture. But little did I know that Lauren’s cute pic was actually a photo of her disrespecting Mother Nature. People quickly pointed out in the comments that, because the canyon walls are so fragile, you’re not supposed to touch them. There’s actually a strict limit on how many people are allowed in Antelope Canyon each day, and you have to apply for a ticket months in advance. As you can clearly see, Lauren is standing on the wall, so she missed the “no touching” memo. 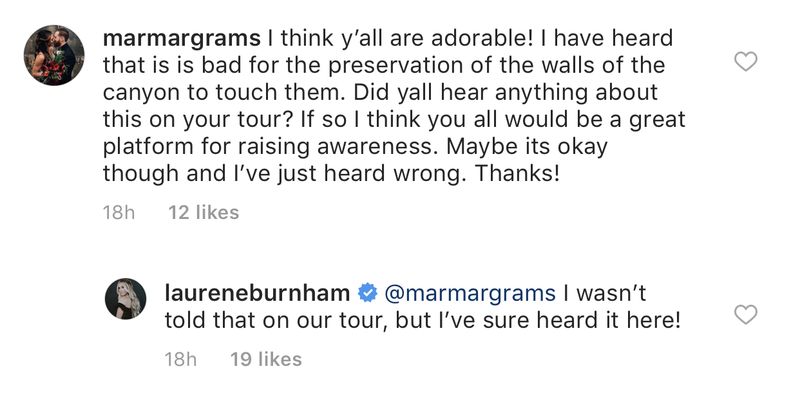 Okay, so I believe that Arie and Lauren didn’t realize she wasn’t supposed to touch the walls. They’re not the sharpest tools in the shed, and we all do dumb sh*t sometimes. What I do have a problem with, however, is that she turned off the comments on the photo, and (according to Reddit) deleted many of the negative ones that were already there. Oh Lauren, sweet Lauren. The apology seems just a little less sincere when you follow it up by blocking out all other criticism. The guys behind Fyre Festival learned this the hard way! I get that people can be brutal in the comments, but just turn off your notifications and let it happen this one time. Turning off comments on Instagram is never a good look. 29 weeks! This week I’m the size of a butternut squash. It’s a bit of an odd shaped vegetable, but I’ll take it. Mom and Dad went on a road trip this week and I learned RV life is fun. It felt like I was on a little rollercoaster for the last few days. Well enough about them let’s talk about me. This week I’m actually dreaming in here when I sleep and let me tell you baby dreams are so random. I had this dream Mom and Dad met on a TV show, like when would that happen 💁🏼‍♀️. Also my little head is getting bigger to make room for my growing brain. Expect me to be more witty week by week 😉 Other than that Mom has been showing me off and she tells me she’s proud of me. All the feels ❤️ Chat again next week, love you guys! Also, in case you were wondering, Lauren is 29 weeks pregnant, which means we probably have less than three months to go before baby Luyendyk is here. Buckle up, because that baby’s Instagram account is only going to get more annoying from here on out.